All environmental concern, if not anthropocentric, is humanly generated, voiced, and valued. Ecology's mission is restoring not just ecosystems but the human communities that sustain and are sustained by them. The book is the centrepiece of a project that combines book, art exhibitions and web-based materials that explore the understandings of the distinctive Desert Channels country of south-western Queensland. The region includes the Channel Country and adjacent Simpson Desert and extends north east of Longreach. Much of the region is production pastoral country, edging onto pure desert. Gibber, sandridges, gidyea country and spinifex country is included, as well as the fertile channel country. The region is the source for the major desert rivers that flow intermittently in central Australia, draining into Lake Eyre. The region includes national parks (Diamantina National Park), conservation initiatives by non-government organisations (Ethabuka, Cravens Peak and Edgbaston stations, are all managed for conservation by Bush Heritage Australia) and some of Australia's most interesting new partnership initiatives for conservation by private landholders (including the new Rivers Protection Alliance, a partnership between pastoral landholders and conservation groups like the Wilderness Society, and Desert Channels Queensland, a community-based natural resource management group). Desert Channels explores the impulse to protect the varied biodiversity of the region, its Aboriginal and pastoral heritage and prehistoric heritage (including some of Australia's most important dinosaur sites). The emphasis of the book is on partnerships that conserve landscapes and communities together. Conservation can be accomplished in many ways, and the book combines many voices to show that the impulse to conserve is shared by local landholders, conservation enthusiasts (from the community and from national and international organisations), traditional owners, professional biologists, artists and historians. Desert Channels was launched in Longreach, Qld and Bourke, NSW. Read about, view photos, and listen to audio of the launch. Desert Channels is available from CSIRO Publishing. ISBN: 9780643097490, 256 pp, Hardback, 260 x 200mm. One of Australia's best known artists, Mandy Martin, together with historian Libby Robin and zoologist Chris Dickman joined conservation-pastoralist Guy Fitzhardinge, deputy chair of Desert Channels Queensland, to explore the impulse to protect the country where Australia's desert rivers rise. Download the audio and read the transcript at the National Museum of Australia's website. End of book CD of radio program Encounter. Property owners address the impulse to conserve in their own immediate 'place', including themes such as conservation effort and production together, fencing areas for conservation, valuing Aboriginal heritage, valuing settler heritage, aesthetic responses including photography and sculpture. The book combines visual appreciation of the region with accessible text about its intriguing natural history, its people and their histories and the various ways that people are working to conserve the land, the rivers and the creatures. It is a celebration of what people in the region value about their place, and what visitors might find when they visit. We envisage a hardback, but not too heavy, well-illustrated book, with strong writing by many prize-winning writers, and featuring the artworks of Mandy Martin, one of Australia's premier artists. It will be a beautiful book, but also a book to read, not just a 'coffee table' book. And it will be a book to listen to as well - with the sounds of the region captured in the CD radio program. Rain in the Simpson: once-in-a-decade floods transform the desert landscape. Read more at the Bush Heritage web site. 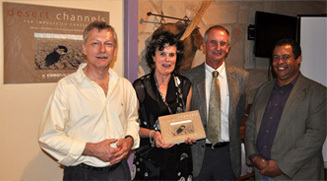 Desert Channels book and exhibition launch, Stockman's Hall of Fame, Longreach, Queensland. Left to right: Chris Dickman, Mandy Martin, Bruce Scott and Dave Thompson. Libby Robin is an environmental historian who has had a long interest in conservation initiatives in deserts. Her books include How a Continent Created a Nation, which won the NSW Premier's Prize for Australian History (2007) and The Flight of the Emu, which won the Victorian Premier's Literary Award for Science Writing (2003). Her most recent co-edited book is Boom and Bust: Bird Stories for a Dry Country (CSIRO Publishing 2009), which won the Whitley Medal in 2009. Christopher R. Dickman is Professor of Terrestrial Ecology at the University of Sydney, and author of the popular book A Fragile Balance: The Extraordinary Story of Australian Marsupials (2007), which won the Whitley Medal for advancing zoological knowledge in 2008. He has been studying the natural history of the Desert Channels area for 20 years, and has published extensively on this. Mandy Martin is one of Australia's best known artists, with work in most major Australian galleries. She is a pioneering scholar in interdisciplinary environmental art projects, including the book, Inflows: the Channel Country (2001) which focuses on this region. 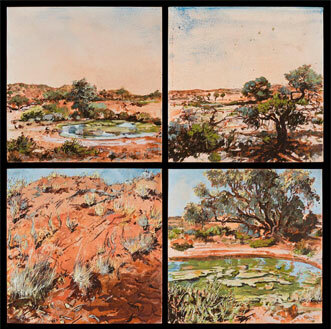 Her art is underpinned by a consuming passion for the future of the Australian landscape, particularly the desert landscapes. Between 1996-2001 Mandy Martin worked in collaboration with pastoralist and environmentalist, Guy Fitzhardinge, historians, Tom Griffiths (Australian National University) and Jane Carruthers (University of South Africa) and art curator Peter Haynes to produce a book and travelling exhibition. Supported by ARC DP0665034 'Producing Biodiversity: A History of Science in Australia's Desert Lands'. Artwork (top left): "Ethabuka Springs" Mandy Martin 2009.